The prevalence of low-density, automobile-dependent communities has resulted in unsustainable lifestyles that increasingly threaten human health and well-being. In addtion to inflating housing and transportation costs and increasing carbon emissions, disconnected communities reliant on cars create sedentary lifestyles. The lack of access to environments that encourage daily exercise, provide clean air and water and offer affordable services and nutritious food has meant growing epidemics of depression, obesity, diabetes, asthma, and heart disease. Working with landscape architects, communities can promote human health and well-being by encouraging the development of environments that offer rich social, economic, and environmental benefits. Healthy, livable communities improve the welfare and well-being of people by expanding the range of affordable transportation, employment, and housing choices through "Live, Work, Play" developments; incorporating physical activity into components of daily life; preserving and enhancing valuable natural resources; providing access to affordable, nutritious, and locally produced foods distributed for less cost; and creating a unique sense of community and place. With health epidemics associated with sprawl on the rise, there is growing demand for communities that get people moving and reduce the onslaught of depression, obesity, diabetes, asthma, and heart disease. Communities can also be designed to reduce traffic fatalities and crime rates. When communities take these issues seriously, they become people-friendly places that promote healthy living and feel safe and secure. A recent study from the Victoria Transport Policy Institute demonstrates that people who "drive less, exercise more, and live longer, and are generally healthier than residents of communities without high-quality public transportation." 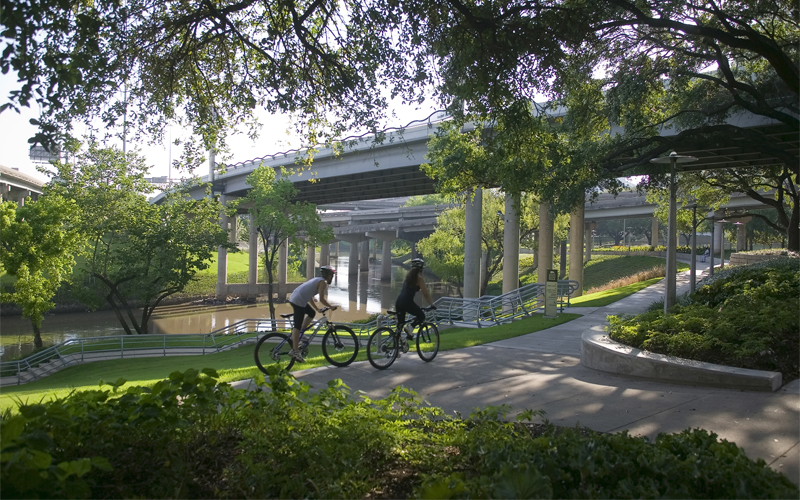 Landscape architects design multi-modal sustainable transportation infrastructure such as public transit, which force people to walk and climb stairs, and well-lit, tree-lined streets with sidewalks and bike lanes, which enable safe and convenient physical activity. These systems provide healthy alternatives to automobile transportation. In addition, landscape architects create parks, green streets, and even green roofs, which encourage physical activity by making outdoor spaces more attractive, cooler, with cleaner air. Communities can also invest in healthy green schools built along new and improved transportation infrastructure and connected to neighborhoods via sidewalks, bike trails, transit service, and roadways that provide safe routes to school. Landscape architects design green school campuses with indoor and outdoor learning environments, which are also available for community activities. In addition, landscape architects work with communities to create urban agriculture projects that provide access to safe, affordable, and nutritious food that is locally produced and distributed. These initiatives make productive use of vacant lots and derelict spaces, transforming them into safe environments for youth education and community interaction. They can provide resources for green hospitals where studies have shown that organic food gardens help patients recover faster. "Frederick Law Olmsted and the Campaign for Public Health," Places, 2010. Incorporating sustainable design into housing can not only make housing more affordable -- these practices lower transportation, energy, and water use costs -- but they can also improve a community’s well-being. Disadvantaged communities often lack affordable and sustainable transportation infrastructure such as sidewalks, bike lanes, and public transit options. According to the U.S. Department of Transportation, 55 percent of annual incomes are currently being spent on housing and transportation, whereas the threshhold for an affordable lifestyle that encourages savings is 45 percent. To combat this trend, communities can work with landscape architects to create housing strategically located in dense, mixed-use and transit-oriented developments that increase mobility and lower the combined costs of housing and transportation. Communities also increase well-being by encouraging sustainable employment growth patterns. Commercial and industrial centers and other places of employment should be strategically located to reduce travel distances between work, home, shopping, personal services, entertainment, and other activities. Landscape architects and planners work with communities to create affordable "Live, Work, Play" communities that offer safe, walkable and bikable environments. In addition, disadvantaged communities also often lack green infrastructure like parks, green roofs, and trees. To lower water and energy costs, communities can work with landscape architects to create green infrastructure systems, which offer multiple benefits. Not only do sustainable green spaces lower long-term water management and energy costs, but they also clean air and water, and can be used to grow fresh produce. In addition, older housing can also undergo energy efficiency retrofits and weathering to further improve affordability. Issues concerning public health, land use, and transportation are inextricably linked. Land consumption caused by the growth of metropolitan regions often results in the permanent loss of rural open space, farms, and forest lands, along with the pollution of watersheds. As suburbs grow and automobile infrastructure expands, urban air and water quality deteriorates, and traffic and carbon emissions increase. Landscape architects can help promote sustainable land use practices through transit-oriented development centered on cost-effective multi-modal transportation. These measures improve accessibility while decreasing automobile dependence, fossil fuel consumption, and carbon emissions, thereby improving air quality and promoting public health. Landscape architects also create sustainable landscapes through the development of derelict land into public parks and the design of neighborhood and residential landscapes that promote water and energy efficiency. Go to Resources guides on Climate Change and Landscape Architecture and Sustainable Urban Development to learn more. Communities should be beautiful places, reflecting the time-honored tradition of civic commitment to high quality and lasting public works. Placemaking practices strive to achieve a unique sense of community and place while preserving and enhancing natural and cultural resources. These practices strategically reshape the physical and social character of a community around civic spaces and cultural activities, ultimately resulting in lasting public works that promote people’s health, happiness, and well-being. In promoting placemaking, communities should protect and even enhance their natural, cultural, and scenic resources by respecting their existing character and avoiding environmental degradation. Placemaking can also be achieved through revitalization efforts that reconfigure existing streetscapes and incorporate vacant lots into new developments created for the human scale. 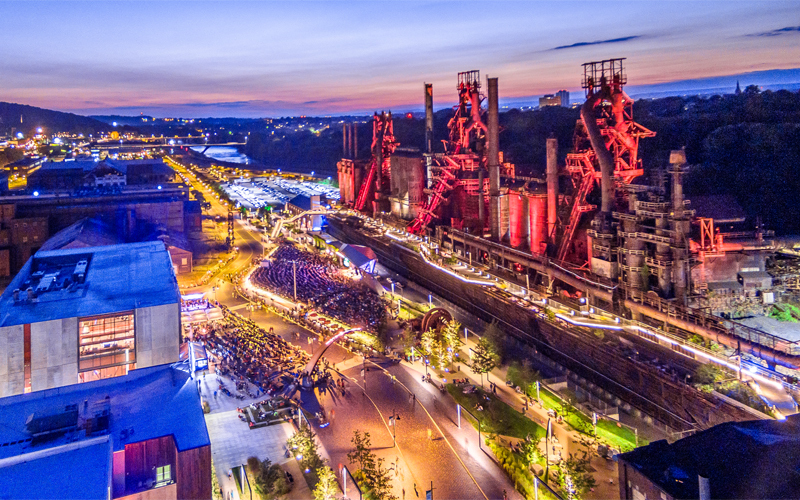 Landscape architects can help communities create places that preserve or enhance natural or cultural resources, spur economic development, attract tourists, and create connections. Traffic-dominated streets, little-used parks, and isolated, underperforming public spaces that contribute to a sense of desertion and placelessness can become places that bring a community back, and eventually help redefine it. For example, brownfields and other vacant lots can be ecologically restored and rehabilitated, becomine new places such as parks and recreation areas with promenades and bikeways. These new landscapes can also harvest stormwater, be used to grow community gardens, or become spaces for a range of vital artistic and cultural events.